Knowing how to pick stocks is one of the major keys to successful stock trading. Stock market picks aren’t found just randomly throwing darts at a list or a chance roulette spin. A terrific way to shift your perspective and get serious about picking stocks is to use probability in developing your stock market trading strategies. Historically, the most successful stock traders have used probability as a strategy-building essential for picking the best stocks. They know that at the heart of picking stocks with a strong directional momentum are factors that can be broken down into pieces and each piece can then be qualified as an element of probability. As you know, a probability is the likelihood of a particular thing to occur. If you want to buy a stock that will likely rise or decline (for shorting), you need to line up as many probabilities in a stock candidate’s favor as you can without over complicating the strategy. Let’s take a look at what kind of probabilities you could be adding to your list for how to pick stocks. Some are pretty basic and some are based on price patterns and technical setups that have been observed of strongly tending stocks. The categories of probability factors are news, market trend, fundamental analysis and technical indicators. News would include company-based information including earnings, new products or services or management-related changes. It could also be economic or political news. The probability of a stock going up on good news may be higher than not, but that factor alone is not enough. The general direction of the market will have an effect on how well your stock trades do for you. Before making a trade, you must know if the market is trending up or down or not trending at all. For example, you would probably want to go long in example A and short in example B. The idea is that a stock price that is a trending may be likely continue to do so and it is not advisable to trade against the trend unless there is a sign of weakness in that trend. For company fundamentals, a high probability factor could be increasing or decreasing earnings, sales, return on investment (ROI) or any other fundamental criteria that can have an impact on the stock price’s value. Theoretically, a company that’s a good value and has good earnings will rise in price. But that’s not always the case as other factors affect the price of a stock, and fundamentals alone should not be used. News, market trend and fundamentals can be a part of your list of stock trading probabilities, but it shouldn’t be your only criteria. News and fundamentals alone can actually be more speculative than applying knowledge of technical indicators to recognize what is occurring with a stock’s price. Combining technicals with fundamentals can be an effective long-term strategy. However, consider that many mid-term holds for several months that are price “high achievers” may not have the strongest fundamentals so a choice has to be made. Do you want to hold a position in a fundamentally strong stock or a stock with strong price movement? Most probability discussions are associated with technical indicators and that’s what the rest of this discussion will be about. There’s a theory called Efficient Market Hypothesis (EMH) that proposes a stock price reflects everything that is known and could possibly change the value of a stock’s price. In other words, all of the circumstances that can affect the value are exhibited by the current price. If that’s true, than studying fundamentals to conclude a stock’s value is redundant. If that’s also accurate, what’s left to interpret price direction? The answer is trader sentiment. 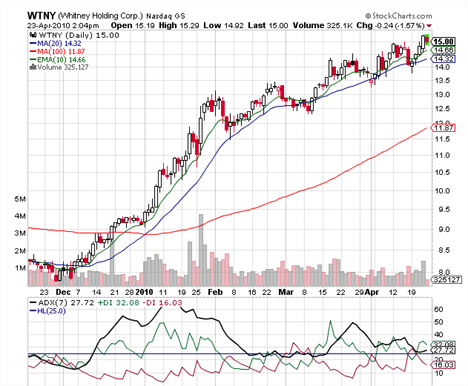 For example, on paper, WTNY is an unimpressive stock. If you look at the fundamentals, they don’t look so great. A look at the competition in the industry group reveals that it is not the best in its group. It’s news hasn’t been overly compelling. So what would induce a non-volatile stock like WTNY to increase in value by 87% in 5 months? At the end of the day, buyer and seller sentiment is what affects a stock price and what technical indicators do is attempt to provide a gauge of the sentiment about value. 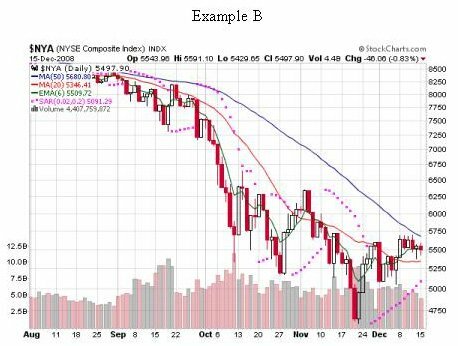 A trader’s job then is to combine a technical indicator strategy to use as a factor of probability for how to pick stocks. The technical strategy has to be logical and as historically consistent as possible. Additionally, the potential strategy’s success has to be confirmed by back testing or paper trading it to see if it has some measure of being successful. All of the probabilities for how to pick stocks then come together to form a stock trading strategy. 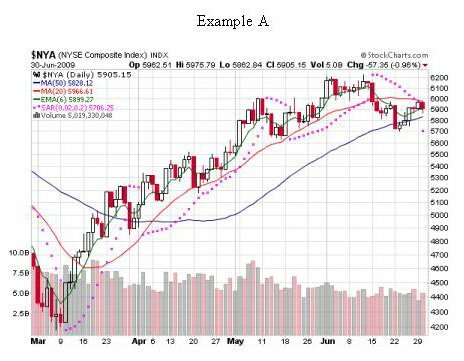 Some technical indicators are MACD, Stochastics, Bollinger Bands, moving average (MA), average directional index (ADX) and there are many more. Additionally, Japanese candlestick formations can give you probable pattern setups too and should be added to the list of probabilities. With all of the choices of indicators you could use, you may be wondering how to decide on a strategy for how to pick stocks that will be successful. The first thing is – it’s got to sound good to you. Using probabilities and parameters, think about the criteria a stock candidate must meet for you to make a trade and create a checklist as part of your trading plan. Some combination of factors can generate success with one indicator as your main information resource and any additional indicator as a confirming resource. That’s the practical aspect of how to pick stocks using probabilities, but it’s not the end of the exercise. Be certain to spend a bit of time back testing the potential strategy. Ask yourself - did the strategy hold up over a larger percentage of found stocks? Or did it fail more than you’d like? No strategy is 100% accurate, but the higher the percentage, the better. If the setup looks good, you take the trade. Go for it. It’s really the best you can do to pay attention to stocks that have set up the way you want. There is no patterm/setup that works every time. Get accustomed to seeing a setup fail so that you take immediate action to liquidate it, reevaluate the market and look for new candidates. 1. Identify probabilities that you think are the strongest. 2. Back test the probable setups. 3. Set up scans to find them. Now you understand the skill and intellect of how to pick stocks using probabilities! If you're ready, it's time to move on to a list of stock trading strategies and how they piece together to create a setup. Return from How to Pick Stocks Using Probabilities to Stock Trading Strategies. Return to Online Stock Trading Home.